In order for a rider to better communicate with his horse, it is important that the rider not just act upon the horse but that he be able receive communication from the horse as well. The rider receives information from the horse through feeling. It is a goal of Anchorage Farm to help the rider develop his ability to sense what is going on with the horse. It is not a common thing in every day life to stop, calm the body and mind and focus on sensations. This is one of the reasons why riding lessons are so beneficial to humans. Since the horse is allowed to communicate, lessons are good for horses as well! A rider has three aids, three parts of his body that he uses to influence the horse. These three body parts also receive signals from the horse. They are the hands, legs and seat. Each is described below. In the very first lesson we teach riders to “follow” the horse’s mouth at the walk. The rider feels the movement of the horse’s neck – back and forward – as the horse walks. From the very first turn we ask the rider to flex (“wiggle the rein” with the student’s ring finger) and release, not to hang, on the inside rein. The inside rein is the asking rein. The outside rein is the supporting rein. It is the feel for the outside rein that insures that the horse does in fact turn. The position of the hand is important: thumb at the highest point of the hand, thumb softly flexed in contact with the rein, hands softly closed around the rein – not pulling, but also not allowing the reins to slip. The rider’s elbow is bent. The hands are in a straight line between the horse’s mouth and the elbow. If the hands are dropped from this line, the rider is leaning his hands on the reins. This most certainly blocks communication! Seat lessons can reduce the rider’s tendency to use the reins for balance, especially during transitions or when something unexpected occurs. Through dressage lessons the rider learns to overcome the natural tendency to rely upon his hands as the first line of sending communications to the horse. In time the hands become an important sensor, a receiver of the energy produced through the rider’s seat and legs. In order to feel the movement of the horse’s legs, it is important that the rider’s own legs lie softly on the horse’s side. It is not natural to have our human legs wide enough apart to wrap around a horse – without creating pressure on the sides of the horse. A beginner rider grasps the horse’s body in apprehension. 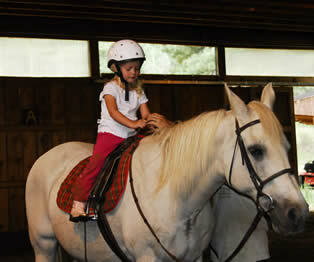 Seat lessons help develop a rider’s balance and confidence such that he can loosen his legs on the horse. 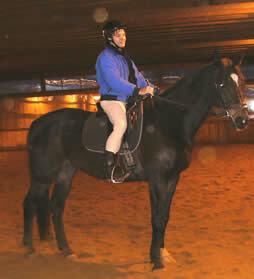 An independently soft rider leg naturally “massages” the horse’s side as the horse moves. It eventually enables very precise communication from the rider’s legs to the horse’s legs. In the very first lesson we teach the rider to apply his/her inside driving leg in concert with the movement of the horse’s inside hind leg. The rider also needs to develop flexibility – in his seat and his leg – such that the rider can effectively use the outside leg as a supporting leg. The weight of the rider’s upper body, as transmitted through his sitting bones through the saddle to the horse’s back, is the rider’s most important aid. It is crucial that the rider sit erectly from his sitting bones such that he communicates effectively through these bones. A rider whose pelvis tips forward is said to have a “fork seat”. A rider whose pelvis tips backward is said to have a “chair seat”. Both of these positions restrict the mobility and communication qualities of the seat. In riding lessons, the student is constantly admonished to “sit up” – with head over shoulders, shoulders over sitting bones, legs dropping down from hip bones - such that the rider’s feet lie under his seat. The rider’s attention to the development of this balance aids the horse! A horse is supremely attentive to the rider’s seat. The horse can feel where the rider is looking. Hence the rider’s eyes are an important aid. Placing a little more weight on the inside sitting bone – without leaning – is a cue for the horse to turn. This in fact happens when a rider even turns his head! The effective use of the seat, and the ability of the rider to feel the horse’s back through his seat, are disrupted by tension anywhere in the rider’s body. It the rider grips with his upper thigh, he tips forward and cannot feel his sitting bones. Tension in the buttocks or lower back also restricts the ability of the seat to follow the horse’s back and to feel the movement of the horse’s back. Whereas the hands can function only as a restricting aid and the legs only as a driving aid, the seat can function as either a restricting aid or a driving aid. A rider who is tense inadvertently uses his seat to restrict the motion of the horse. One of the greatest joys of riding is to become aware of one’s sitting bones and the profound effect that they can have upon the horse. Seat lessons are instrumental in reducing tension within the rider’s body such that he/she can better feel the horse and judiciously use each aid to more effectively communicate with the horse. When the rider is able to merely balance on his sitting bones, the horse is as free as Pegasus, the horse with wings! It takes time to learn to coordinate the use of one’s aids. Coordination only comes through experience and through the help of a patient and knowledgeable instructor – and a patient and knowledgeable horse! We are eager to help you in your journey to better communicate with your own horse – or any horse. You will do this through calming your body and through feeling!